The Spokes go to Bristol! When it comes to cycle culture, Bristol is one of the finer cities in our country. They’ve won the title of the UK’s first “cycling city” and with this came some finances to promote cycling. Welcome to the stage: “Bristol Cycle Festival”, a month of cycling related joy! The Spokes traveled down and spread our love of bicycle dancing to our West-Country friends. On Saturday we performed two city centre shows in glorious sunshine to a great variety of crowds. We witnessed pedal-powered stages, a bicycle carousal and met some brilliant people. On Sunday we joined the UK’s only bicycle carnival. Instead of your usual parades powered by trucks, this was a gathering of floats on bicycles. Never have we seen such creativity on two wheels. The Spokes joined the parade through Birstol on our newly decorated bikes. After the carnival brought one of the most amazing moments of our bicycle dancer careers. For years The Spokes have been Europe’s only bicycle dancers, but that is no longer the case. 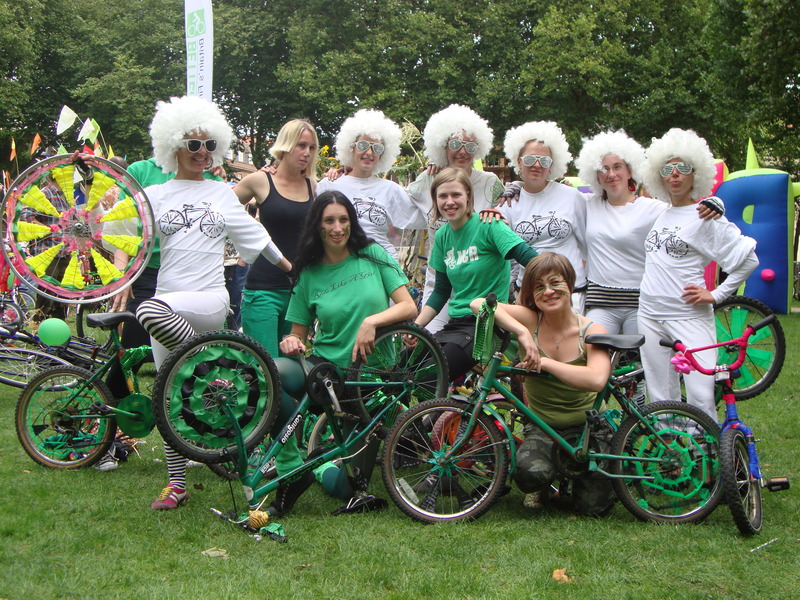 Welcome to the scene, Les Velobici, Bristol’s bicycle dancers! Over the past few months we’ve been in contact and organized a special performance for the Festival. We believe this to be the world’s first Bicycle Dance Off! To the sounds of Run DMC (what else?) we strutted our stuff, pulled of our sick tricks, and entertained a surprisingly huge crowd! We hope this to be the start of many new things. A recognized and growing bicycle culture in a British City, a bicycle festival with the support of all the right authorities, the building of a national cycle community, and the growth of bicycle dancing!